History is fickle. During the 19th Century, Ernestine Rose was one of the most important and famous international advocates for feminism, free thought and anti-slavery. She worked closely with renowned figures in this movement such as Susan B. Anthony and Elizabeth Cady Stanton. Despite her contributions to feminism, atheism, and anti-slavery, since her death she has slowly been erased from history. 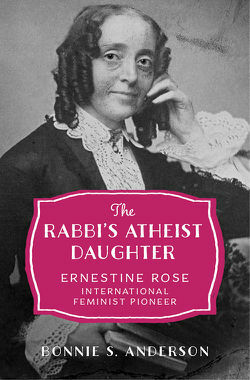 Bonnie S. Anderson's new book The Rabbi's Atheist Daughter:Ernestine Rose, International Feminist Pioneer published by the Oxford University Press is an effort re-illuminate the contributions of this remarkable women. 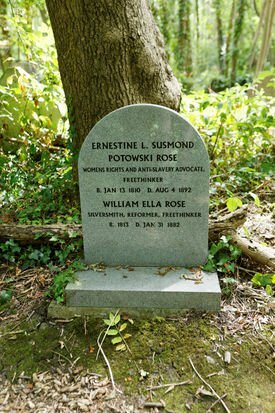 Historian Pamela S. Nadell stated that "Bonnie Anderson uncovers, in this deeply researched work, the astonishing life of Ernestine Potowski Rose, champion of all human rights." 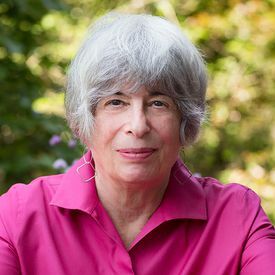 Bonnie S. Anderson is an emerita history professor at the City University of New York and a lifelong New Yorker. She probably could best be described as a women's historian, but this focus has allowed her to study and write about a diversity of topics including the 19th Century Atlantic world, feminism and the history of sexuality. You can read another interview with her about her career as a historian at the AHA blog. She has published several books including the classic A History of Their Own: Women in Europe from Prehistory to the Present Volume 1 and 2, Joyous Greetings: The First International Women's Movement, 1830-1860, and Women in Early Modern and Modern Europe. You should also check out Professor Anderson's Blog. Here is our interview with Professor Anderson. How would you describe yourself as a historian? I was trained as a cultural historian at Columbia in their Modern European History program, which included Britain. I have always used culture – poetry, novels, paintings - in both my teaching and writing. Ernestine Rose was at the heart of the 19th-century American feminist and abolition movements, but I am far less familiar with her than her contemporaries such as Lucretia Mott, Elizabeth Cady Stanton, Susan B. Anthony and Sojourner Truth. Why isn’t she better known? Why has she been written out of history? I think there are three chief reasons. First, Rose’s life was truly international. She was born in Poland and lived there until she was 17. She then spent two years in Berlin, followed by 15 months in Paris. From 1831 to ’36, she lived in London, where she became a follower of Robert Owen, the industrialist-turned-socialist. His teachings became her life-long creed. This international heritage profoundly shaped her life, so just dealing with U.S. history tended to exclude her. Second, she and her husband returned to England in 1869 and remained there for the rest of their lives, returning only for a visit in 1873-4. So it was easy to exclude her from the American narrative. Finally, she has no archive. In old age, she discarded the newspapers and writings that told the story of her life, convinced that no one would be interested in her. It wasn’t until Paula Doress-Worters’ anthology of her speeches and writings appeared in 2008 that I felt I could write her biography. Why did you become interested in writing about Rose? What made her such an intriguing subject? I first encountered her in Miriam Schneir’s wonderful 1972 anthology of feminist writings, but really began researching her life for Joyous Greetings, which examined women’s international connections in the middle of the nineteenth century. Rose was central to this movement and I ended up using her early life to show how these women became feminists. Although she does not have an archive, there are three extensive interviews with her and these provided the details of her career. The only child of a Polish rabbi, she lost her faith as a teenager. Her mother died, leaving her an inheritance, and her father betrothed her to a man she didn’t want to marry. So she traveled by sleigh to a Polish court, pleaded her case and won – at seventeen. This amazing story fascinated me. How had she been able to do that? How had she found the backbone to thrive as the only Jew, atheist and foreigner within the early women’s movement? 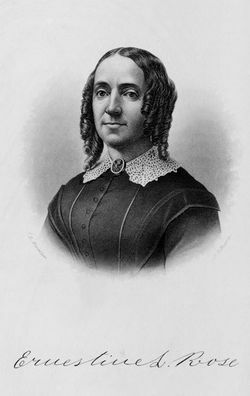 Many 19th-century American feminists were motivated by their Christian faith, but Rose was an atheist and a Jew. What impact did her atheism and Jewish heritage have on her standing within the women’s right movement? In all my research, I only encountered one person who continually displayed antisemitism towards Rose in the women’s movement – her co-worker Lucy Stone. Stone wrote Susan B. Anthony that since Rose looked Jewish, was avaricious and only out for herself, she should be excluded from the movement. (Stone also disparaged foreigners.) Anthony, Rose’s friend, paid no attention. Her atheism was more of a stigma within this religious group. But Rose consistently downplayed her nonbelief at women’s events. There, she never called religion “superstition,” as she often did elsewhere. She did argue against using the Bible as an authority for women’s rights, maintaining that since “women’s rights were human rights” they preceded biblical authority. A number of her co-workers agreed with her. She also avoided the difficult topic of divorce until Stanton raised it in 1860. Stanton and others argued on Christian grounds that women should be able to divorce drunkards and other sinful men. 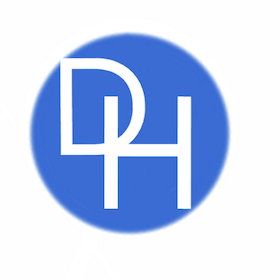 Rose finally presented her view of marriage as “a human institution,” which should be ended when the parties no longer sympathized with each other, but only if their children were provided for and their property divided equally. When Rose’s beloved husband died, women like Anthony and others lamented that she did not have the comfort of knowing she would meet him in Heaven. But they accepted Rose’s freethought, as well as her lack of belief in spiritualism. When you were researching this book what did you learn that surprised you the most? The extent of Rose’s atheism and the free thought communities that supported her. I knew about her feminism and her abolitionism, but not much about her free thought. During one of her first public speeches in New York, she was shouted down as an “Infidel,” the derogatory term for freethinkers then. In 1845, she argued that the freethought society of “Moral Philanthropists” should rename themselves “The Infidel Society,” embracing the term much the way gays and lesbians embraced the label “queer” in the late twentieth century. When she went to England in 1869, she was welcomed by a large freethough community, members of which became her closest friends. What do you want your readers to take away from your book and Rose’s story? History is written by the victors and in the process, many important themes and people get lost. Rose’s life demonstrates that a woman could staunchly defend women’s rights, free thought, and abolition in the middle of the nineteenth century. She was a true hero and amazingly eloquent. I want her to be remembered as part of our history. Who should read your book and how would you recommend using it in the classroom? What Was the Fate of Women During the Bangladesh Liberation War?